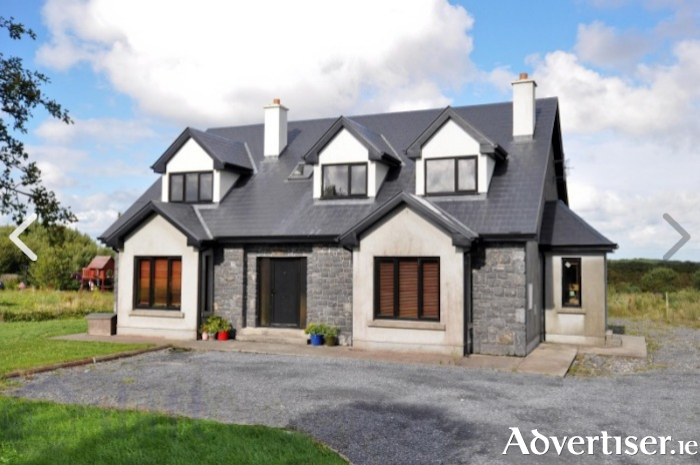 Situated in the very popular area of Homefarm/Leagaun, just 1.5 miles from Moycullen village, the property enjoys beautiful views of Lough Corrib. Internally, the entrance hallway is bright and spacious with maple hardwood flooring, pine staircase, and guest wc positioned beneath the stairs. To the left of the hallway is a very impressive living room with timber flooring, bay window, and stunning feature limestone fireplace. An archway gives access to the kitchen/dining room which is complete with built-in kitchen, breakfast island, and ample space for dining. There are also double doors to the south facing rear garden from this room. There is also a good sized utility room off the kitchen. To the right of the hallway is the second reception room, again boasting timber flooring, bay window, and impressive limestone fireplace. Currently there are double doors leading into a large 350sq ft space which in the original plans would have been the master bedroom, however the owners had this converted to an open plan kitchen/living/dining room with wet room while using the second reception room as a bedroom. This however can very simply be changed back to the original layout with very little cost involved. There are four further bedrooms on the first floor. To the right of the landing are three good sized double bedrooms, one positioned to the rear and two to the front of the property. The spacious master bedroom is located to the left of the landing which boasts a very generous en suite bathroom with power shower and a walk-in wardrobe. With the exception of the bathrooms all of the upstairs floors are a high grade oak laminate. The family bathroom is bright and airy and has been tastefully tiled with raised bath/shower, wc, and whb. The house is positioned on a lovely size site of circa 0.5 acre and foundation has been laid for a garage. This truly is a lovely family home and must be viewed to be appreciated. Guide price is €370,000. The BER is C1. For viewing times and further details contact Shane Cox on 087 9830450 or Lynch auctioneers on 091 566157.